I thought it would be smart to sandwich up the quilt and add the borders flip and stitch style. I pinned the main body every few inches but there was 2+ inches more border on on side then the other. Time to rip 8 border strips off and regroup. I Started with the main body, pinned it to death then quilted it. Still one corner went haywire and I had to tear out 9 square inches of heavy quilting. I FINALLY got the top sandwiched into a rectangle with even length sides. THEN I applied the straight of grain borders all around twice. The borders being on the grain were much easier to quilt although not as easy as other fabrics. Darn you Kaffe!! I quilted the borders on three sides waiting for the baby to be born then I could add the name, date, length, and time of birth. Now I am actually going to PLAN the spacing instead of my usual flying-by-the-seat-of-my-pants method. I measured a strip of paper the size of my opening. Now on to the quilting. You have such patience! 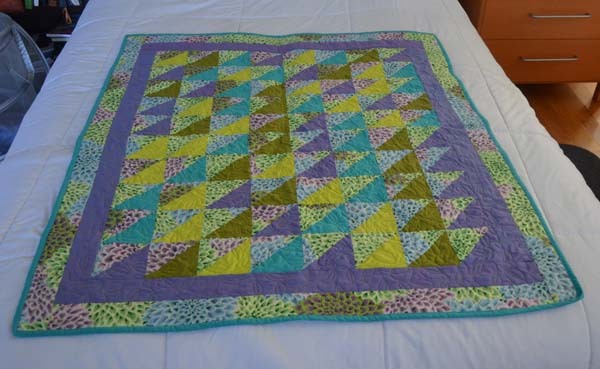 Once I hit a snag, I have to really talk to myself to undo what is wrong and do it right... the quilt is lovely, in spite of all your struggles! Really like this quilt, Beth. You always, always put together the colors beautifully! What a struggle and what a patience you show! It is a beautiful quilt, I love the colours and the design, simple and very effective, well done. A very beautiful quilt, I like colors and design! I congratulate you because you have a determination to do such great things.